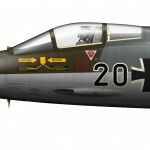 The German Luftwaffe recieved a total 916 F-104s and operated the Starfighter until 1987. It was completely phased out in 1991 after having used the old bird for various testing purposes. 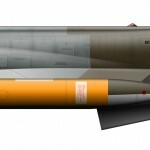 The Jagdbombergeschwader 32 (Fighter Bomber Wing 32) flew the Starfighter from 1965 until 1984. Currently JaBoG 32 is disbanded since 2013. 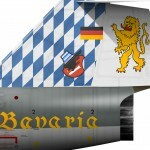 This 20+62 is adorned with a traditional Bavarian blue/white pattern on its tail.